This gallery contains copies of all the known pictures that show either the original B5000 or the upgraded models, the B5500 and B5700. They are copied so we can be sure that they are not lost; please contact us if you would like the copy removed and the image linked instead. The physical layout of all three models are the same, 5 to 7 main system cabinets depending on the amount of memory and whether one or two CPUs. The B5500 and B5700 are identical systems, the difference being that the B5700 system could be extended with the B6500-series peripheral DATACOM processor subsystem (DCP) and the use of B6500 memory modules as extended memory for the B5700. 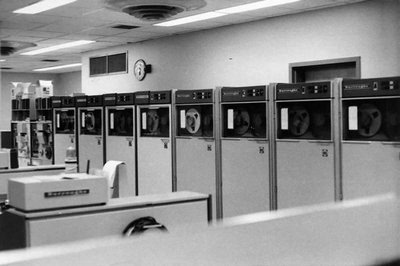 The B5500 consisted of 5, 6 or 7 main system conjoined cabinets and various additional separate cabinets for the Burroughs Disk File or peripheral options (magtapes, printers). Most pictures found so far are of fully expanded systems, that is two memory cabinets (for a maximum of 8 x 4096 x 49 bit word memory modules, total of 32kW) and two CPU cabinets. Processor A is located in the cabinet at the left-hand side, then the IO channel cabinet, Display and Distribution cabinet, Central Control cabinet, then two memory cabinets, and finally Processor B on the right-hand side. SPO (Supervisory Printer Output), the system console. A custom Smith-Corona-Marchant electric typewriter appeared in Burroughs marketing literature and images that came from Burroughs offices. However, the field deployments mostly used a modified Teletype Corp Model 33 KSR teletypewriter. The modification was to add an array of buttons down the right hand side to control message hand-off. However, this particular type of SPO did not appear to be commonly deployed, instead it was replaced with a modified Teletype Corporation Model 33 ASR or KSR. Due to the limited duty cycle of the Model 33 (just a few hours use per day was recommended by Teletype) most sites had a spare on-hand since the Model 33 frequently broke down due to being worked too hard (they were only intended for light duty compared to other models such as the Model 35 which was a 24-hour continuous-use Teletype). It was common in the 1960s/70s (sporadically into the 1980s) with large systems, the system console was usually delivered integrated with custom furniture. The early Unisys A-series mainframes from the 1980s still continued this tradition with a custom metal table to support the console (SPO) CRTs (as seen here). Below is another scan of the picture from above (originally from the brochure for the Burroughs B5500 INFORMATION PROCESSING SYSTEM). This scan is colour adjusted to show more detail, but lacks the slight sepia tone of the original. The powerful advanced systems concepts of the Burroughs B 5500 are fully complemented by the revolutionary Burroughs On-Line Disk File subsystem. With its "head-per-track" design, the Disk File provides all-electronic access to any record throughout the file in an average of 20 milliseconds. File organization, programming, and use are simplified because access is entirely by electronic switching, with no moving arms, card drops, or the like. Each record segment is equally available regardless of physical location on the disks. Multiple segments can be transferred with a single instruction. 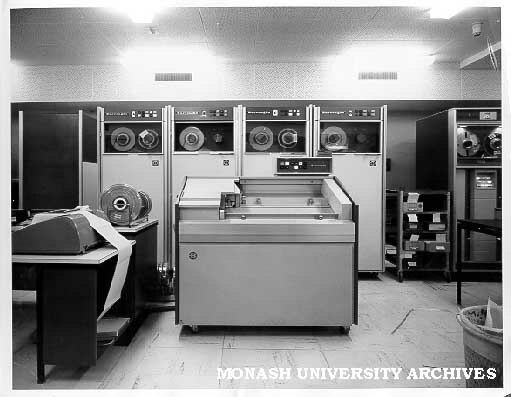 Module size is four disks totalling 9.6 million alphanumeric characters of information capacity. Up to 100 of these modules may be used with the Burroughs B 5500, effectively extending the memory of the computer systems by almost a billion characters. Transfer rate is 100,000 characters per second. In Canada: Burroughs Business Machines Ltd. This is the only known front-on picture of the B5500 Distribution and Display panel, at the bottom of this web-page another image from Bob Doran that shows where the panel was situated in the sequence of cabinets. Bill Leary provided an edited image comparing the above picture with the B5500 reference manual showing that sections of the processor panel indicators are not visible to three sides of the photo. Paul Kimpel notes that the above photo is not of a B5500 system, but a smaller Burroughs office-scale computer, probably the B100, B200 or B300 (the CPU cabinet is the second standalone from the right). These smaller Burroughs machines were competitors to the IBM 1401 range. In the centre of the picture is a Burroughs "Disk File" (5 cabinets joined side-by-side). The Disk File in this picture has the EU (Electronics Unit) in the left cabinet, with 4 SU (Storage Units, each with several head-per-track disk platters) connected to the right, for a total of about 40 megabytes of storage. The B5500-styled cabinet in the far rear left corner is the DFCU (Disk File Control Unit). Two images of the Stanford B5500 circa 1966, from Bob Doran. This shows an exception to the observation above that the SPO was usually a Teletype 33 Model. In these pictures the Smith-Corona-Marchant electric typewriter acting as the SPO. In the right foreground, is the B129 card reader. Image from Robert Doran (with thanks). Rare view of the Burroughs B5700 showing the Display and Distribution Unit (the panel with the "blinkenlights"). In the foreground left a card reader. Image from Robert Doran (with thanks). Lady seated at Burroughs system console SPO (Smith Corona Marchant) with Burroughs tape drives in the background. This is purportedly a RobertStock image, if anyone has more details on where this picture was taken and by whom we would like to know. Man seated at Burroughs system console SPO (Smith Corona Marchant) with Burroughs tape drives in the background - identical to the image directly above but the lighting has changed. This is purportedly a RobertStock image, if anyone has more details on where this picture was taken and by whom we would like to know. B129 Card reader is just visible in the middle left of the image.